Permission is granted to make and distribute verbatim copies of this document for non-commercial private research purposes provided the copyright notice and this permission notice are preserved on all copies. NOTE: Throughout, the ON spelling of the term "Víking" has been substituted. "Viking" appears in the original. This document was originally a pamphlet that accompanied classes I taught in the East Kingdom of the Society for Creative Anachronism, Inc. Some changes have been made, mostly in order to refer to other webbed documents or graphics. The main choices one makes when constructing a Víking tunic are these: what fabric should I choose? How should I pre-treat the fabric? How should I cut out the pieces? What do I want the neck to look like? What kind of seams should I use? How should I trim it? With which other garments should I wear it? Generally speaking, a new tunic will satisfy the maker more if all these questions have been answered before the tunic is cut. This pamphlet will not discuss fabric pre-treatment; this is a question that any competent garment-maker, modern or SCA, can answer easily. Nor does it discuss the basics of tunic construction or pattern drafting; this too any competent garment- maker can provide. The questions of fabrics, trimmings, and garment layering are touched on briefly: some suggestions for appropriate textile and color choices are included, and some information is included on decorative techniques that will help you create ensembles based on a particular time and/or place. However, the specific focus of this pamphlet is to help you make the choices of cutting, neck shape, and seams that will make your tunics specifically Víking in design. The word "tunic" really does not adequately describe the number of different shirt- and coat-type garments worn in the Víking Age (eighth through eleventh centuries, roughly speaking). Accordingly, this work will use a variety of names for the body garment. "Smock" refers to an undergarment, the thing we in the Society might call a shirt if a man wore it and a chemise if a woman wore it. "Tunic" is a man's short-skirted sleeved garment, much as we already understand it. "Gown" is a woman's long- skirted sleeved garment. "Jacket" is any man's sleeved wraparound overcoat with overlapping lapels, and "coat" is any man's or woman's sleeved overcoat that is buttoned or pinned closed. The recommendations made in this pamphlet are based on actual clothing and clothing fragments together with the conjectural reconstructions devised by archaeologists, textile experts, and costume historians. Such information has come to light in the following places: Thorsbjerg (Scheleswig-Holstein, Germany), Migration Era; Evebø (Norway), fifth century; Birka (Sweden), ninth and tenth centuries; Bjerringhøj ("Mammen," Denmark), tenth century; Hedeby (Schleswig-Holstein, Germany), tenth and eleventh centuries; Jorvík (the Danelaw in England) and Dublin (Ireland), tenth and eleventh centuries; and Viborg (Denmark), eleventh century. However, there is much more information out there than is suggested by this short list of sources; it just isn't germane to this particular pamphlet. See the bibliography for several jumping-off places, not all of which are written in English. Some translations from works in German by Inga Hägg have been made accessible to me through the generosity of Mistress Marieke van de Dal, sine qua non, ne plus ultra, whom I thank profusely. The Mediterranean-style "cross" tunic, woven or cut in one piece seems not to have been a northern European design. One author (Hald 1980, 338) suggests that the colder northern climate requires that clothing fit more closely than in the sunny south. Certainly, the evidence from as far back as the Bronze Age is that northern Europeans were fashioning garments cut and sewn in several pieces for a close fit rather than the loose blousy fit of a cross tunic. The Thorsbjerg tunic is a well-preserved tunic found in a bog in Schleswig-Holstein, Germany, in an area that was part of Denmark during the Víking Age. It dates to the period just before the Víking Age, and for the purpose of this pamphlet it is regarded as a suitable early example of pre-Víking tunic construction. It was made in four pieces: separate rectangular front and back panels sewn together at the shoulders plus two sleeves. The neckline was made by simply not sewing the middle section of the two panels together, giving the effect of a boat neck. A pucker was put at the back of each sleeve, 7cm below the shoulder seam, to give a slightly more fitted effect at the sleeve-to-body seam. Each sleeve was tapered toward the wrist not by cutting the sleeves with a taper but by folding and seaming the lower half of the sleeve more narrowly than the upper half. The sleeves were overly long with narrow wrist openings; the visual effect of wearing such a sleeve might be like the one so frequently encountered in manuscript illuminations of the period--small folds encircling the arm just above a tightly-fitting wrist. According to the measurements given in Hald (1980, 339), the tunic would come to about mid-thigh on someone 5'7" tall, and the boat neckline would extend out to approximately the collarbones on each side of the neck. The wrists and the bottom of the tunic were trimmed with tablet-weaving. Although it isn't specifically mentioned in either Hald, who describes the tunic in detail, or in Owen-Crocker, who cites only Hald in the text but also includes both a plate and a drawing of the piece, there may also be tablet-weaving around the neckline. The garments of the fifth-century jarl buried at Evebø, Norway, are too fragmentary to determine the way they were made. The remains are mainly useful for what they reveal about tunic length, decoration, and layering. The two wool garments were found in situ with one worn over the other. The red undertunic had elaborate tablet-woven wool trim at the neck, wrists, and hem, with bronze wrist clasps; it came down as far as the knee. The overtunic had a different type of tablet-woven wool trim at the neck, plus silver clasps in some undetermined location (Magnus 1982, 68-69). Given the existence of the silver clasps, as well as the striking appearance of the undertunic, the overgarment may well have been some sort of a coat designed to augment, rather than cover, the undertunic; the clasps might have held it together on the chest. The excavations at Birka, Sweden, which cover the ninth and tenth centuries, did not include entire garments. However, the pieces of clothing that were found there yielded quite a bit of information on different types of tunic-type garments, including smocks, tunics, and coats. There is plenty of evidence for linen smocks, wool tunics, wool and linen coats, and even one possibly Byzantine-style linen long tunic. Construction details common to them all include front and back panels cut in one piece, rather than two-piece construction with shoulder seams, and small round or keyhole necklines. Triangular gores were added for additional width in the skirt area of many garments. Unique to Birka is evidence for the woman's pleated smock from the tenth century; this style of undergarment would not have required gores for widening. Also unique to Birka is the men's sleeved "riding" coat closed on the chest with small cast bronze buttons running from neck to waist; it is thought to be influenced by Persian riding coats by way of Byzantium and the Rus lands. Some Birka women wore a similar overgarment, but instead of bronze buttons this coat was held together by a fancy brooch pinned through two small loops that were sewn to the two sides of the garment at the mid-chest. It is not known how long the women's coats were, but clearly if they were meant to be protective overgarments they would need to be rather long--and require more than one closure point in front! Here below are suggested composite styles for a Birka tunic and coat. Note especially the dotted fold lines at the shoulders of both garments and the choice of two necklines offered on the drawing of the tunic garment. The tenth-century finds from Hedeby harbor offer sharp contrast to the Birka style. Here are found wool garment pieces that display rounded armholes for fitted sleeves, two-piece body construction with shoulder seams, and scoop-style necklines (Hagg 1984, 171). Evidence for torso styles includes both a narrow style with skirt slit at the sides, suitable for undergarments, and a wider style with closed skirt and gores for more flair, suitable for overgarments. Here is a suggested composite Hedeby-style tunic. Also found at Hedeby is late tenth- or early eleventh-century evidence for a short bathrobe-style jacket with overlapping front panels. Similar garments are known from earlier Saxon graves on the Continent and believed by some to have had some military or ritual significance (Owen-Crocker 1986, 114-115); they are also depicted in Migration Era artwork such as the Sutton Hoo helmet plates. The remains of one jacket from Hedeby had a trimming made of madder-dyed fake fur, which was a strip of woven wool with tufts of unspun wool inserted into the weave. Here is one possible reconstruction of such a jacket with its trimming of fake fur. At Jorvík (York, England) several early eleventh- century pieces came to light that are thought to have belonged to a young child's linen smock. They comprise two sleeves, a side, and part of an underarm gusset assembly (Walton 1989, 348). The last of the Víking Age garments to be listed here is the Viborg linen smock dating to the eleventh century that was found at Viborg Søndersø, Denmark. Although many of the pieces had come apart, much of the shirt was recovered. This smock has the split sides of a type of Víking Age garment defined by Hägg (1984, 177) as an undergarment; it is also unusual for having a clear waist seam on both front and back panels. The rear shirttail flap on this garment wraps around the front flap slightly, just below the waist. The sleeves are cut in two pieces each and also include square underarm gussets. The illustration is of the reconstructed smock, which is most remarkable for having the first clearly identifiable cinch-style neckline (and square neckhole) of any Víking Age garment. (In fact, I don't know of another extant garment or piece of garment with this type of neckline, let alone a square neckhole, in any early period northern European context!) The original shirt was two layers thick; the front and back chest panels were "quilted" together with running stitches. The detail illustrated here shows both the pattern of the "quilting" and the functioning of the neckline. There is a slit on the outer layer of the garment, at the right side of the wearer's neckline where the two layers of the garment overlap; the functioning of the drawstring depends on this overlapping section. The square neckhole was cut all on the front panel and edged with a raised strip which becomes a sliding drawstring at the front corners of the neckhole. Some garments, particularly undergarments, were made of linen, hemp, or nettlecloth: many such smocks and the occasional coat have been found. Although other forms of linen weaving were known at the time, the archaeological evidence indicates that almost all of these materials were in tabby weave. Linen, ramie- cotton, or cotton-linen blends in tabby weave are easy to find and make very appropriate choices for smocks, gowns, and lightweight coats. The interlacement of a tabby weave looks like this. Wool gowns, tunics, jackets, coats, and lower-class smocks (that is, body garments for people who couldn't afford linen) were woven in 2/2 twill most commonly, although some examples exist of broken chevron (herringbone) twill, broken lozenge twill, plain broken twill (Kreuzkoper), repp, and tabby. In the later Víking Age (tenth and eleventh centuries) 2/1 twills became common. Also in the later Víking Age, some overgarments were thick and fuzzy with less of a prominent twill texture. Of these weaves, 2/1 twills and herringbones are the easiest to locate commercially. The interlacement of a 2/2 twill looks like this. The interlacement of a herringbone or broken chevron twill weave looks like this. The interlacement of a broken lozenge twill looks like this. The silk textiles used in the Víking Age were of roughly two types: plain tabby-woven and samite, or silk twill. Plain tabby-woven silk is fairly easy to come by; although "raw silk," or silk noil, is very unlike Víking Age silk tabbies in texture, its thread count is quite appropriate. Silk gabardine makes a good approximation of unpatterned samite, while rayon challis in a suitable solid color makes a good substitute for plain samite; it has the right kind of softness, sheen, and twill texture. Unfortunately, good substitutes for patterned samite are wildly expensive and/or rare. No doubt a whole host of dyestuffs were used about which we know nothing now; however, the following dyestuffs are known to have been used on Víking Age textiles: reds from madder (and kermes, on imported silks), yellows from broom (and weld, on imported silks), blues from woad, purples from the lichen Rocella tinctoris, browns from walnut husks, and even an instance or two of black derived from walnut shells and iron (Hägg 1984, 289). Overdyeing also achieved greens and a large variety of violets and purples. Evidence for the use of particular colors is strong in particular areas: reds are most often found in the Danelaw, purples in Ireland, and blues and greens in Scandinavia proper (Walton 1988, 18). Although it is carefully hedged, there is a hypothesis in the scientific world that this might possibly reflect regional color preferences rather than archaeochemical factors; feel free to use this Víking heraldry if you like the idea. Naturally pigmented wool was used also, so off-whites, grays, blacks, and browns are all appropriate. Some evidence for woad- and madder-dyed linens exists, but most linens were undyed, which means that "natural" through bleached white colors are also appropriate for linens. There are various reasons to pick a particular cutting draft. One might choose the draft that is most similar to tunics one has made in the past; one might choose it for reasons of authenticity, that is, one that is close in time and/or place to the persona for whom it is being made; or one might choose the style of tunic that one happens to know will look good on the recipient. Hopefully, sufficient information is provided in this section to make all three types of choices easier. garment pieces are cut on the grain, that is, with warp threads running vertically on the piece, rather than on the bias. This is even true of underarm gussets and edging strips. where sleeves are preserved, they taper toward the wrist. neckline: keyhole (definitely known from ninth- and tenth- century Sweden); rounded (definitely known from tenth- and eleventh-century Denmark); or "boat" style (definitely known from Migration Era Denmark). Keyhole necklines work well on undergarments because they can be clasped close to the neck, whereas rounded or boat necklines are less close-fitting and work better on overgarments. side seams: slit, especially for men's smocks (definitely known from tenth- and eleventh-century Denmark); straight (definitely known from Migration Era Denmark); and straight with triangular gores inserted (definitely known from ninth- and tenth-century Sweden and tenth- and eleventh-century Denmark). Women's smocks and gowns almost always require gores. Men's riding coats require gores in order to achieve the fullness of skirt that is needed to ride a horse while wearing the coat; gores are optional on tunics and probably not needed on jackets. Men's smocks can have slit sides for greater freedom of movement. sleeve/armhole: straight seam (definitely known from Migration Era Denmark); straight or tapered seam with square underarm gusset (definitely known from tenth-century Danelaw and eleventh-century Denmark); and rounded armhole with rounded sleeve (definitely known from tenth- and eleventh-century Denmark). Individuals with large chest measurements proportional to the rest of their anatomy--many women and fighters, especially--will find that tunics with straight seams don't fit as well because they don't provide any extra room across the chest. shoulder construction: front and back panels cut with seams (definitely known from Migration Era, tenth-, and eleventh- century Denmark); front and back panels cut in one piece (definitely known from ninth- and tenth-century Sweden). Decide how each element of the tunic should be constructed before cutting out anything; then, if need be, make patterns out of paper for each piece that you will need. If you do make paper patterns, be careful to label each pattern piece with the name of the intended wearer of the tunic, the name of the pattern piece (e.g., "sleeve"), and the date. That way you will have a record of how you made the tunic; then you can repeat it if the tunic happens to come out perfect, or adjust the pattern pieces if the tunic isn't perfect. The front and back panels of a tunic work fairly well if they are as wide as the measurement between the points of the shoulders, plus seam allowances on both sides. Gores can be as narrow or as wide as you like, but if they are too wide they will hang in deep folds rather than draping gracefully. It is almost impossible to reconstruct the sleeve length and overall length of Víking garments from the pieces that remain. Since sleeves were designed to be close-fitting at the lower end, it is likely that they were wrist-length. Iconographic evidence suggests that tunics were worn at least to mid-thigh, probably down as far as the knee. Jackets seem to have been on the short side, while Birka riding coats were probably longer than the garments they were worn over, perhaps even calf-length. Women's gowns might in some cases have extended only to the lower calf or, as depicted in some figurines, drag behind with a miniature train effect, depending on what sort of work may have needed to be performed while wearing them. Ankle-length gowns and smocks suit the climate and activity level of Pennsic very well, while the train effect is very attractive in a Court setting. Evidence for Víking garments frequently includes linings; in particular, the coat garment was often lined with silk or linen. Necklines were generally not faced, but enclosed by or edged with durable or decorative trimmings. This effect can be achieved in a variety of ways--by the use of bias tape, purchased trim, braided wool yarn, tablet-weaving, or silk edgings cut out of larger pieces of fabric. The main thing to remember when sewing a Víking tunic is that the Víkings were much more relaxed about letting a seam show on the outside of a garment than we are. Indeed, some seams were even sewn in contrasting thread, quite possibly with the intention of adding decorative flourishes to a garment. Seams were also decorated in some cases with narrow braids or cords (about 1mm wide): the braids were sewn down on the outside of the garment over the line of the seam. Seam treatments used in the Víking Age usually involve both a running stitch and an overcast stitch. These seams include several variations on the idea of flat-felling; a running stitch holds the two pieces of fabric together, then the seam allowances are folded in one of a variety of ways and tacked down with one of a variety of overcast techniques. The seam frequently shows on both sides of the fabric. Another interesting technique shows up in late tenth-century Hedeby: the seam is sewn with a running stitch on the inside of the garment, and the two raw edges are folded in and overcast together, giving the effect of a French seam. Hems came in a variety of styles, usually depending on the weight of the fabric; lightweight silk hems were usually rolled; linen, lightweight wool, and heavy silk ones were double-folded; and heavy wool ones were single-folded. Sometimes hems were sewn with contrasting color thread or in small groups of upright stitches for decorative effect. For more information on seams, hems, and seam finishing, see the drawings in Walton 1989 and Hägg 1984. Hand-sewn Víking garments are of course preferable, as authenticity of technique usually is when it's not dangerous; however, it's usually an unrealistic expectation that people will hand-sew their garb. In such cases, practical adaptation of these sewing techniques to a machine-sewn garment is fairly simple. Flat-felled seams work well on smocks; the material for such an undergarment is light enough that it is not difficult to flat-fell a seam, and the machine stitching will not show if the appropriate overgarment is worn. However, flat-felling is less appropriate for outer layer garments such as tunics, coats, jackets, pants, apron-dresses, and gowns; this is true not because visible stitching is inappropriate to Víking garments but because the kind of overstitching performed by a machine does not look like the kind of overstitching performed by a Víking hand. In such a case, French seams work very well and make the garment much more durable than a less careful seam finish would. Edge treatments show an interesting similarity across the entire Víking world. If the edges are hemmed, then the hems are most commonly left unadorned, although one or two decorated ones, such as the tablet-woven hem on the tunic of the Evebø jarl, have been found. But a large number of edges, especially at wrists, jacket flaps, and necks, were ornamented by strips of silk samite. Samite was a product of Byzantium, a thick, rich, silk twill that was woven in patterns that were often elaborate and multicolored. The strips cut from samite and used to decorate Víking garments did not follow the directions of a pattern; some surviving strips seem to have been cut by someone with a healthy disdain for the weaver's intentions! Once cut into strips, sometimes the silk was treated like bias tape (i.e., enclosing the raw edge of the garment material), and sometimes the edges of the samite strip were folded under neatly and the whole piece sewn down (i.e., like trim) on top of the garment material. This is probably the single most common element in Víking Age garment decoration. Two definite examples of embroidery on the tunic garment have been uncovered: the Oseberg women both had embroidery on their upper gowns. Sable, marten, and squirrel fur was also used as a trimming and possibly a lining on some of the Birka coats. Much more common than embroidery or fur, however, was the use of metal-brocaded tablet-woven bands; they were applied directly to tunics, gowns, and coats, or sewn to strips of samite that were then applied to the garments as described above. These bands were usually a centimeter or less in width and involved a single bright color brocaded with silver; isolated examples of gold brocading, and of the use of more than one color of background, also exist. A form of decoration unique to Birka was the solid or spiral-wrapped silver wire that was worked into knotwork, little figures, or mesh patterns; it too was often sewn to samite before being used on men's coats and their matching hats. Some of the interesting trimmings from Birka have been misinterpreted in several mainstream books on Víkings. One particularly blatant instance of this is the horizontal overlay from Birka Grave 735. Dating to the mid-tenth century, it consisted of strips of silver brocaded tablet-weaving sewn horizontally across a rectangle of samite, which was then sewn down to the chest of a man's wool tunic (Geijer 1938, 165-6). Additional strips of silk and tablet weaving ran up his arms (Hägg 1986, 69) as well as around the arms of the tunic. This is the find that has inspired the drawings of men in Rus riding coats in many Víking picture books, including Almgren and the cover of the Osprey Elite Series book on the Víkings. Those drawings are wrong; no coat garment is known to have been decorated in such a fashion. The man in the coat on the cover of the Osprey Elite book is also wearing an artist's misinterpretation of the Reverskragen, or lapel, which was found in some of the other graves at Birka. The Reverskragen probably belongs on a jacket, not a coat. Follow this link for a portrait of my husband wearing a Birka-style tunic with a reconstruction of the chest portion of the Grave 735 trimming. One tenth-century Birka overtunic was decorated with long vertical strips of brocaded tablet-weaving from shoulders to calves (Hägg 1986, 69), which must have looked somewhat like Byzantine clavii. It was also trimmed with Chinese self- patterned damask silk (Geijer 1983, 86); at the time the man was buried, the silk would have been several hundred years old! As a very general rule of thumb, it is appropriate to layer several garments together for warmth rather than depending on one blanket-like outer tunic. Both men and women can wear smocks made of linen or an affordable approximation. Men wear a tunic over the smock, women a gown. Women wear an apron-dress over the gown. Men can wear the jacket or a light cloak for a degree of warmth. Men and women can both wear the coat garment for more warmth. For more information on garments and their ornamentation in the Víking period, see also the documents on Þóra's Víking Resources page. Almgren, Bertil, ed. 1966. The Víking . Stockholm: Tre Tryckare, Cagner & Co. This book has much to recommend it, but its reconstructions of men's garments are 25 years behind the times and even misunderstand much of the material that was available when the book was written! The man wearing the cruciform headband and the little scarf with the stag on it is based on misinterpretations of factual evidence from Birka. Don't make the mistake of basing your garb on this fellow. Dal, Marieke van de [Christina Krupp]. 1992. "New Sources for Víking Men's Garb," Pikestaff Arts and Sciences Supplement , pp. 21-23. Pittsburgh, Pennsylvania: Society for Creative Anachronism, Inc., December 1992. 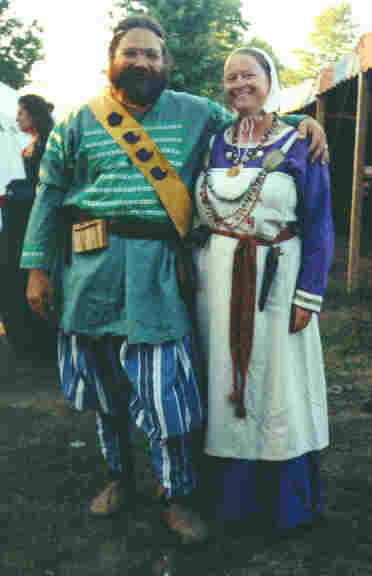 This article details some of the Hedeby and Birka garments. It is illustrated with Víking paper dolls. Fentz, Mytte. "An 11th Century Linen Shirt from Viborg Sondersø, Denmark," Archaeological Textiles in Northern Europe , pp. 83-92, ed. Lise Bender Jørgensen and Elisabeth Munksgaard. Tidens Tand 5. Copenhagen: Kongelige Danske Kunstakademi, 1992. An in-depth analysis and reconstruction of the most complete surviving linen smock from the Víking Age. Geijer, Agnes. 1938. Die Textilfunde aus den Gräbern . Birka: Untersuchungen und Studien III. Uppsala: Kungl. Vitterhets Historie och Antikvitets Akadamien, 1938. This book is an early paradigm of archaeological textile scholarship, but it's not available in translation. Great plates of metal trimmings, and extensive lists of textile finds broken down by grave. Geijer, Agnes. 1983. "The Textile Finds from Birka," in Cloth and Clothing in Medieval Europe , ed. N.B. Harte and K.G. Ponting, pp. 80-99. London: Heinemann. Good, digested, English version of Birka III . Skims over all the types of garmet-related finds from Birka. Great photo of some Víking macramé in situ, some diagrams of the patterns on tablet-woven metallic trims, and brief discussion of the unusual embroidered and twisted wire trims. Hägg, Inga. 1974. Kvinnodrakten i Birka: Livplaggens Rekonstruktion pa Grundval av det Arkaeologiska Materialet . Uppsala: Archaeological Institute. An early survey of the Birka finds; short German summary at the end. Her later works are much more useful, though. Hägg, Inga. 1983. "Víking Women's Dress at Birka: A Reconstruction by Archaeological Methods. : Cloth and Clothing in Medieval Europe , ed N.B. Harte and K.G. Ponting, pp. 316-50. London: Heinemann. Hägg, Inga. 1984. Die Textilfunde aus dem Hafen von Haithabu . Berichte über die Ausgrabungen in Haithabu, Bericht 20. Neumünster: Karl Wachholz Verlag. Write-ups on the garment pieces used as caulking that were discovered in Hedeby harbor. Distinguished by careful analysis of weaves, suggested reconstructions of cuts, and useful information about sewing stitches and techniques. Lots of good photos and diagrams for those who don't read German. Hägg, Inga. 1986. "Die Tracht." Birka II:2, Systematische Analysen der Graberfunde , ed. Greta Arwidsson, pp. 51-72. Stockholm: Almquist & Wiksell. A modern re-analysis of dress at Birka, building on the work of Geijer but also incorporating microstratigraphic work on some of the preserved lumps of textiles. Quite valuable: confirms or refutes many of the major assumptions about clothing in the period, and even offers fledgling theories of the evolution of fashion. Hald, Margrethe. 1980. Ancient Danish Textiles from Bogs and Burials , trans. Jean Olsen. Copenhagen: National Museum of Denmark. In addition to write-ups on a huge variety of finds of textiles from the Bronze Age through the medieval period, this book contains a good diagram of the Thorsbjerg pants pattern. Good drawings and a few very good photos. Heath, Ian. 1985. The Víkings . Osprey Elite Series 3. London: Osprey Publishing Ltd.
A good, concise book on Víkings from the military standpoint, with several reasonable colour drawings. The most undocumentable features of these plates are the cross-gartering-- a Frankish style--and the trimmings on the bottoms of tunics-- only found at pre-Víking sites like Evebø so far. Although it's nice they included one, the drawing of women's garments is pretty bad. Ingstad, Anne Stine. 1988. "Textiles from Oseberg, Gokstad and Kaupang." Archaeological Textiles: Report from the Second NESAT Symposium, 1-4 May 1984. , ed. Lise Bender Jørgensen, Bente Magnus, and Elisabeth Munksgaard, pp. 133-149. Arkaeologiske Skrifter 2. Købnhavn: Arkaeologisk Institut, Købnhavns Universitet. Krupp, Christina, and Priest-Dorman, Carolyn. 1992. "Women's Garb in Northern Europe, 450-100 C.E. : Frisians, Angles, Franks, Balts, Víkings, and Finns." Compleat Anachronist 59 (January 1992). Milpitas, California: The Society for Creative Anachronism. Some more in-depth discussion of Víking Age textiles, trimmings, and women's garment layering is available in this pamphlet. Magnus, Bente. 1982. "A Chieftain's Costume: New Light on an Old Grave Find from West Norway." Textilsymposium Neumünster: Archäologische Textilfunde, 6.5 - 8.5.1981. , ed. Lise Bender Jørgensen and Klaus Tidow, pp. 63-73. Neumünster: Textilmuseum Neumünster. A catalogue of the six textiles from the Evebø find, a man's burial from the fifth century containing, among other things, plaid pants and cloak. Some garment information is included. Owen-Crocker, Gale R. 1986. Dress in Anglo-Saxon England . Wolfeboro, NH: Manchester University Press. Assembles linguistic, iconographic, and archaeological information on men's and women's clothing in England from the period of the Saxon invasion to the Norman invasion. Not without its flaws, but the best one-book version out there; good footnotes and bibliography. Recently issued in paperback. Pritchard, Frances. 1988. "Silk Braids and Textiles of the Víking Age from Dublin," in Archaeological Textiles: Report from the Second NESAT Symposium, 1-4 May 1984. , ed. Lise Bender Jørgensen, Bente Magnus, and Elisabeth Munksgaard, pp. 149-61. Arkaeologiske Skrifter 2. Købnhavn: Arkaeologisk Institut, Købnhavns Universitet. Roesdahl, Else, and Wilson, David M. 1992. From Víking to Crusader . New York: Rizzoli International Publications Ltd. This is the catalogue of the 1992-1993 exhibition that toured Europe, the largest exhibition of Víking Age artifacts ever mounted. Some of the photos and exhibits are being reported and published for the first time in this book. A few of the the write-ups are not in line with current thinking, and the two-page article on dress has many serious inaccuracies, including the "reconstruction" of the Mammen outfit on page 193 that obscures such elementary information provided by the original find as which embroideries were in proximity to others! Still, on grounds other than that of garb documentation, it's well worth the $65 it costs, and it's still available in some places. Walton, Penelope. 1988. "Dyes of the Víking Age: A Summary of Recent Work," in Dyes in History and Archaeology 7, pp. 14-19. Although kind of technical, the best few-page summary out there. Contains information on spectrochemical analysis as well as botanical information for various Víking Age dyes. Walton, Penelope. 1989. Textiles, Cordage and Fiber from 16-22 Coppergate . The Archaeology of York, Vol. 17: The Small Finds, Fascicule 5. Dorchester: The Council for British Archaeology and The Dorset Press. Careful, detailed archaeological analysis of the textiles found from the late ninth- through early eleventh- century period of the Anglo-Scandinavian site of Jorvik. A linen find thought to be a child's smock is discussed, in addition to textile production generally and the specific fibers, weaves, colors and construction stitches used there.